A couple of weeks ago we were in a fish and chip shop in New Quay—not the English Newquay in Cornwall but the one on Cardigan Bay in Wales. As we were eating our fish and chips we looked out of the window overlooking the bay and could see the Welsh coastline sweeping northeast towards Aberystwyth then up to Snowdonia then round to the northwest and the tip of the Lleyn Peninsula where Bardsey Island is. Along this spectacular panorama various mountaintops and stretches of hills are visible; not the beaches of North Wales (they are below the horizon) but higher ground, and we wondered which hump was Snowdon, the highest mountain in Wales. We asked the chip shop lady, as she sees this view most days of the year but she didn’t know, nor did the other Welsh ladies in the shop, who began guessing as they gazed into the distance. Nobody knew. 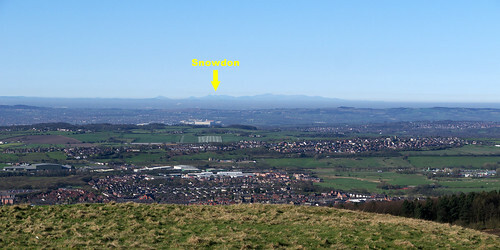 The perspective image from Google Earth (above) is comparable to my panoramic photomontage (top) and the method is the same one I used to demonstrate that the summit of Snowdon is visible from Winter Hill near where I live in the North of England—though it must be a clear day with good visibility. The method is quite simple in principle but might need some fiddling about in Google Earth. You begin by putting a Google Earth ‘placemark’ at the exact place where the photo was taken. A second placemark is put on top of the summit of whichever hill or mountaintop you want to identify. 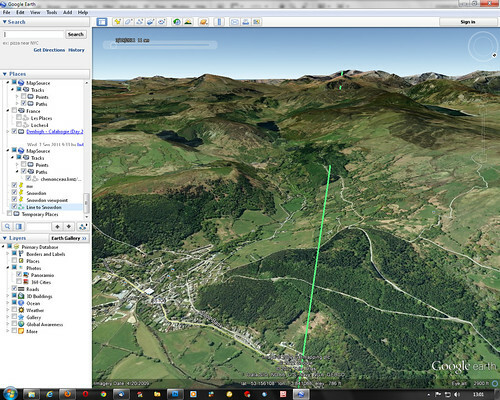 Then add a Google Earth ‘path’ between the two placemarks. All that is easy. You then zoom down, using the various controls, to a few (virtual) feet above the first placemark and ‘fly’ along the line towards the second placemark. Eventually the ground profile begins to match the one in the photo, or approximately, because in Google Earth as you approach the target hill the earth’s curvature disappears whereas in the photo it obviously doesn’t. But with care you can identify a hill or mountain with certainty. 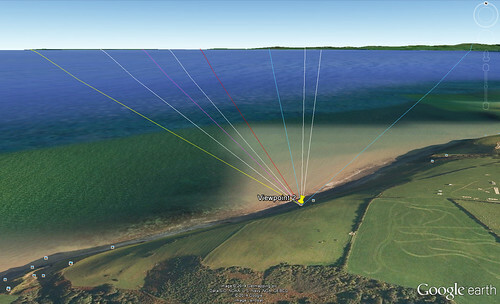 The following images illustrate the comparison between Google Earth’s view of Yr Eifl (as an example) and the one in the photo. The rest of it is just the same process repeated for each hill or mountaintop. Identifying distant mountains can be difficult from a photograph partly because the curvature of the earth hides lower ground and also because mountains in front of each other tend to merge into a single profile due to the haze. Even in Google Earth as you ‘fly’ towards a particular mountain the view of others around it changes from the one in the photo. That’s why it’s fiddly, but it works. It surprises me that people in New Quay (if the chip shop ladies are typical) aren’t curious to know what they’re looking at. They have a superb view. I have marked Llanbedrog in red in the panorama photo because of the dozens (hundreds) of times we have stood on the headland there and gazed across Cardigan Bay in the other direction—that also is a superb view. One of the best views I have ever seen in the UK is a similar one southeast from Rhiw near Aberdaron at the very tip of the Lleyn Peninsula. great shot of Snowdon from Winter hill. seen it myself from there but probably not as clear. your site isn’t allowing me to post web links, but if you haven’t discovered these in the meantime (since 2014) try “peak finder dot org” or viewfinder panoramas in google. the latter also recommends ulrich deuschle’s excellent site too which helps to identify mountain panoramas from almost any point. much easier than that hard work you’re doing on google earth! Thanks. I didn’t know about peakfinder – very good. When I went to it in Google the Winter Hill panorama appeared automatically (presumably from Google detecting my IP address and guessing which is the best view from the nearest vantage point). We agree on which is Snowdon (from Winter Hill, and also nearby Moel Siabod which has superb views in all directions). I can actually see them from my house but it needs to be very clear. In theory my house must be visible from the top of Snowdon. Here is the peakfinder view that corresponds with mine above: Cardigan Bay from the chip shop in New Quay. PeakFinder is impressive but what’s interesting with the Google Earth method is how the digital view image corresponds with the real thing.